At this site, a quick access to the most up-to-date real time data of greenhouse gas concentrations is provided. 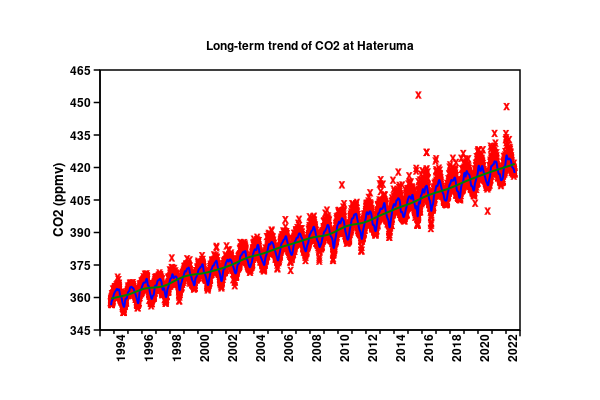 Hourly data of CO2 concentrations measured at CGER monitoring stations at Hateruma and Cape Ochiishi are being updated to the GGTU database in real time. 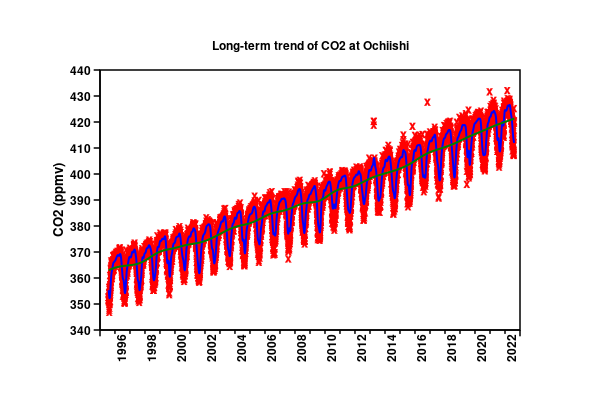 Here, the annual increase of GHG concentrations and daily, weekly, monthly and annual means of the latest CO2 concentration data can be seen. The daily means are calculated from hourly data, and are used to analyze long-term trends and to estimate the annual increase rate. Also data on hourly variations of CO2 concentrations in the past week, month and year is provided at this site. With speediness being the highest priority, raw measurement data sent automatically from the measuring equipment at the monitoring sites is provided here. Although it is essential to obtain accurate concentration levels when monitoring various atmospheric components such as CO2, due to the process of calibration of the standard gases used for the measurements and the omission of unreliable data, it can take up to a year to determine the correct numbers. When the final values are obtained after data processing, the quick data of this site is replaced with the refined data. For more accurate calculations, please use the refined data in the Database.